Cassandra Lee of Delta makes a pass Tuesday versus Otsego in a Division III girls soccer sectional semifinal. The Panthers disposed of the Knights with ease, 12-0. 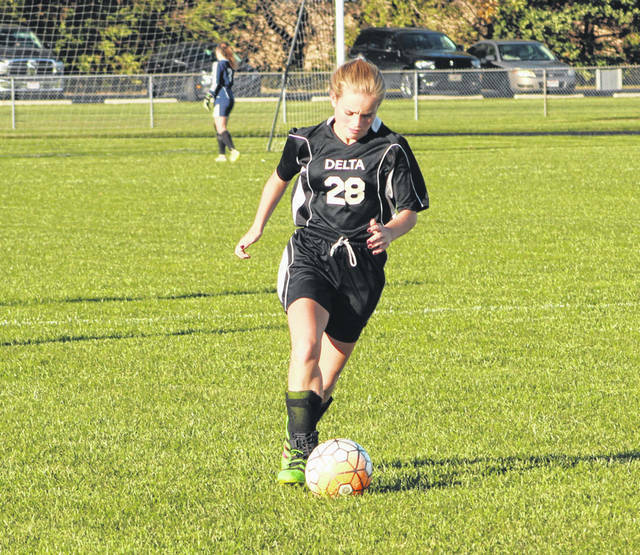 Samantha Maurer of Delta drives the ball near the Otsego goal during Tuesday’s game. She had a goal in the contest. Kayla Kunar of Delta advances the ball up the field. 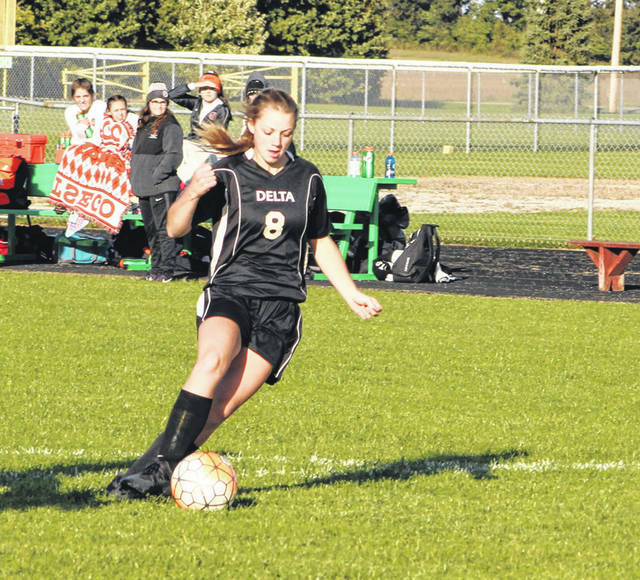 Delta tallied four goals in the first 10 minutes and that was pretty much all she wrote, finishing with seven first half goals total in a 12-0 win at home over Otsego in a Division III girls soccer sectional semifinal Tuesday. Their first two goals came a minute and 14 seconds apart from one another. Alayna Mitchell found an opening in front of the net 1:44 in for a 1-0 lead. Then, at the 37:02 mark, Jessie Giguere intercepted a goal kick and fired it into the back of the net. 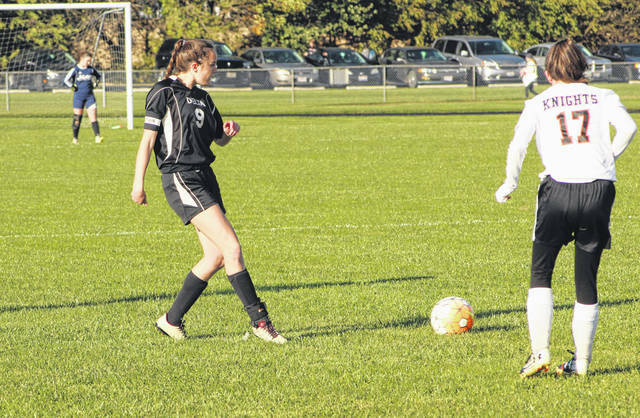 The Panthers would make it 3-0 when Marissa Cargill raced past the Otsego defense and scored with just under 33 minutes left in the half. Mitchell scored her second goal roughly two minutes later, taking advantage of a whiff from a Knight defender to increase their lead to four. Next up was Mariah Mattimore, who fired one home while falling to the ground with defenders draped on her with 23:11 to go in the half. Cassandra Lee finished off scoring in the half for Delta with a pair of goals. Her first was a beauty as she overcame a tough angle to loft one over the Otsego goalkeeper from the left side, extending it to 6-0 with 18:26 remaining. Lee added another later in the half, closing out the scoring. Mitchell, Giguere, and Lee – three of Delta’s four seniors – each finished with multiple goals. Recording a hat trick was Lee. “That’s what I knew was our strength (this season), is that we had a good class of seniors,” said Triana. “They grew up playing soccer (together). I knew that we could always count on them throughout the year. Giguere started scoring in the second half when she put one in from just inside the penalty area 2:11 in. This made the margin 8-0. Other second half goals came from Samantha Maurer, Lee, Anna Munger and Courtny Helton. The Panthers will now prepare for a sectional final matchup with NWOAL champion Liberty Center Saturday at 2 p.m.